Welcome to the five hundred and sixty-first of my blog interviews with novelists, poets, short story authors, biographers, agents, publishers and more. Today’s is with travel and crime writer Margaret Piton. A list of interviewees (blogged and scheduled) can be found here. If you like what you read, please do go and investigate further. Morgen: Hello, Margaret. Please tell us something about yourself, where you’re based, and how you came to be a writer. Margaret: I’ve been a writer for most of my adult life. I didn’t have a clear career direction – considered diplomatic service, law, academia and other fields, but I had always done well in school on written work and won a contest or two. Jobs were scarce when I started looking, and I was about to become a ski bum in Vermont when I received an offer from a trade magazine in Washington DC. That was followed by stints with newspapers in Montreal, Toronto and Ottawa, writing about business and travel. I’ve also worked in academia, teaching political science and journalism in university for brief periods, and in corporate communications. I’m based in Montreal. Morgen: Although a ‘ski bum’ sounds fun I would have picked writing too. You write non-fiction, how do you decide what to write about? Margaret: Generally I write about what interests me, although from time-to-time I’ve accepted assignments more for the money than out of interest. Morgen: Sadly it has to be done. Having quit my job in March I’m appreciating how tough it is to be a full-time writer. What have you had published to-date? Margaret: I’ve published a lot, mostly in newspapers and magazines – there is a partial list of my freelance articles under publications on my Website, www.travelwriterforhire.com. My first book, co-authored with Susan Lukowski, was published in 1972 by Potomac Books. 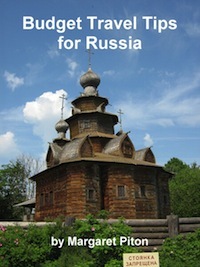 Margaret: I have just published my second book, “Budget Travel Tips for Russia”, myself as an ebook. I decided on this format because the book is relatively short, and because of the difficulties of today’s publishing scene. Morgen: It is and that’s pretty much why I went that route, although I only tried fourteen agents so I could have tried harder. 🙂 Did you have any say in the titles / covers of your books? How important do you think they are? Margaret: Yes, I had a say in both, but I’m not sure how important they are. I used one of my own photos as the cover of the Russia book. Morgen: It’s a wonderful picture, what an intriguing building. What are you working on at the moment / next? Margaret: I’m working on my second crime novel, titled “Siberian Spring”, and considering doing a second ebook “Budget Travel Tips for Cruises”. Morgen: Cruises are so popular, it’s a great topic to choose, and I’m a big fan (and writer) of crime novels. 🙂 Do you manage to write every day? Margaret: I don’t try to write every day, and I have gone through long periods when I have written little or nothing. Morgen: Oh dear, but you clearly enjoy it, which is the main thing. Do you do a lot of editing or do you find that as time goes on your writing is more fully-formed? Margaret: I usually edit once and that’s it. Perhaps I should edit more, but with newspaper training you tend to go with what you have. Morgen: Writing non-fiction at least you have the facts there so it may not need it – perhaps your newspaper training has made do you write a cleaner first draft. Do you have to do much research? Margaret: I adore research—it’s much more fun usually than writing. I especially enjoy research on history, geography, psychology and travel. Morgen: Would you like to do mine? 🙂 Research and editing are my two least favourite aspects. Do you have pieces of work that you think will never see light of day? Margaret: Yes, I have an unfinished spy novel set during the Cold War. Morgen: That sounds great, hopefully never say never. You said earlier that you “accepted assignments”, do you pitch for submissions and / or are you commissioned to write? Margaret: I used to get a lot of commissions, but now it’s more a matter of pitching usually. Margaret: Yes, I’ve had a number of rejections, like virtually every writer. I try not to pay much attention to them, but it’s hard. Morgen: Easier said than done, for sure, but I like to think it’s just the right thing for the wrong person. Do you enter any non-fiction competitions? Margaret: I did enter a couple in the past, and won one or two, but these contests aren’t around now. Morgen: That’s a shame. They are hard to keep going. I’m involved in two (https://morgenbailey.wordpress.com/competitions-calendar/he-bates and https://morgenbailey.wordpress.com/competitions-calendar/nlg-poetry-competition and they generally lose money or break even – with judge fees (which are generally worth every penny! ), prizes, postage etc it’s hard). Do you have an agent? Do you think they’re vital to an author’s success? Margaret: I have tried to get an agent for a novel recently, but no luck yet. Agents do seem to be necessary for fiction writers. When I was publishing the most nonfiction, there were very few agents here in Canada. Morgen: It’s tough for them at the moment and I know some have become small presses as it’s often easier to secure business (from both angles) that way. How much of the marketing do you do for your published works or indeed for yourself as a ‘brand’? Margaret: I don’t enjoy marketing, but I realize it’s necessary in today’s environment. 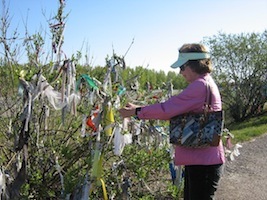 I do enjoy writing my blog, www.yourtravelwriter.blogspot.com. It’s similar to a budget travel column I wrote for many years for The Globe and Mail, Canada’s newspaper of record. I’m also on LinkedIn, Facebook, Twitter etc. I’m going to be giving some talks / workshops to promote my ebook on Russia. Morgen: Oh great! Perhaps you’d like to do me a guest blog post on the subject. 🙂 What’s your favourite / least favourite aspect of your writing life? Has anything surprised you? Margaret: My favourite thing about writing is that you can do it anytime, any place, and as much as you like. My least favourite thing is the difficulty of making a living as a writer. What has surprised me is that so many people seem to think everything, including the work of writers and other artists, should be free. Morgen: They’re the most popular answers for that question, and the ones I’d give. What advice would you give aspiring writers? Margaret: Understand that it is a long, tough slog. You may have initial success, but at some point your luck will change. Read the books of Julia Cameron (The Artist’s Way, The Sound of Paper) for good ideas about perseverance. Morgen: Or if you don’t have that initial success it may just be round the corner. If you could invite three people from any era to dinner, who would you choose and what would you cook (or hide the takeaway containers)? Margaret: I would invite V.I. Lenin, Carl Gustav Jung and master spy Sidney Reilly and I would have an elegant dinner catered (though I would not expect Lenin to eat much—he was famously ascetic.) I would be fascinated to learn what Jung thinks about the other two, especially Lenin. How could such a civilized, brilliant, highly energetic person turn into a mass murderer once in power? Morgen: I’d love to be a fly on the wall at that party. 🙂 If you had to choose a single day from your past to re-live over and over, what day would it be and why? Margaret: The day would be the first staged public reading of my play, “Analysis of a Revolutionary”. It is an imaginary account of the analysis of Lenin by Jung, set in 1916-17 in Zurich and in 1923 in Moscow. The reading took place in September, 2001, and there is a brief video clip from it on my Website. The day of the reading I was extremely anxious, terrified that no one would show up or like it. Also, I was doing the music intro and afraid I would screw it up. I felt euphoric when the play was well-received—it was really the best day I can remember. There’s nothing like writing success. Morgen: Wow. Congratulations. If any of your stories were made into films, who would you have as the leading actor/s? Margaret: I would like Tom Cruise to play Lenin and Colin Firth to play Jung in my play. Margaret: No party tricks, but I enjoy tennis and working out at the gym, and of course travel, reading and studying, especially languages. I’m working on Russian now. Morgen: My father was in Russia for a while (on business, I think) and later took my mum their for an anniversary (possibly their silver). It looks an amazing country. Are there any writing-related websites and / or books that you find useful? Margaret: Any books by Julia Cameron or Natalie Goldberg and Hemingway On Writing, a small paperback. Margaret: I am worried about the future of writing and writers, since it is very hard now to make a living writing. Some people have the energy to hold day jobs and write on the side, but that’s not ideal. Morgen: I’m very lucky that I gave up mine in March although I’ve had to get a couple of lodgers instead but I wouldn’t go back. I had a dream the other day that I just started a full-time secretarial job (I used to be a secretary). It was scary. 🙂 Thank you, Margaret. As I post an interview a day (amongst other things) I can’t unfortunately review books but I have a list of those who do. I welcome items for critique for the four new writing groups listed below and / or flash fiction (<1000 words) for Flash Fiction Fridays. For other opportunities see Opportunities on this blog.